Manny Pacquiao made boxing history Saturday night (Nov 13) when he became the first boxer to win titles in 8 different weight classes after he defeated Antonio Margarito and was crowned the World Boxing Council’s Super Welterweight champion. To achieve last night’s victory, Pacquiao used a combination of speed and power to defeat Margarito, who the 150 pound Filipino turned into a bloody mess. Full story (along with pics) when you click below!! 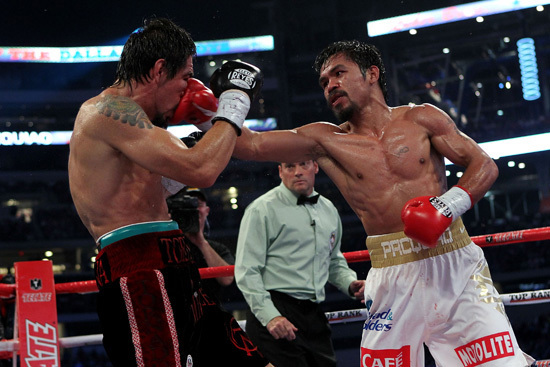 Manny Pacquiao more than made up with speed what he lacked in size. Giving away both pounds and inches, boxing’s little superstar turned Antonio Margarito into a bloody and nearly blind fighter with a dizzying array of punches Saturday night in a lopsided decision victory that wasn’t close from the opening rounds on. 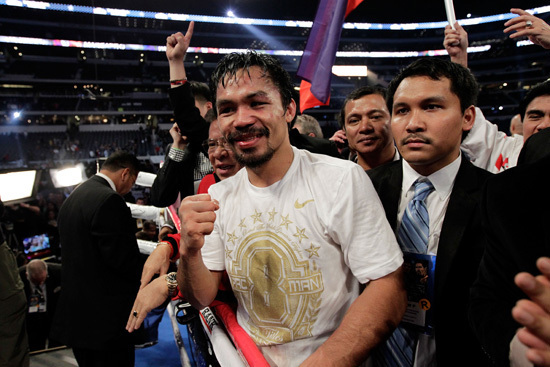 In a spectacular performance before a delighted crowd of 41,734 at Cowboys Stadium, Pacquiao cemented his claim to being the best fighter in the world by dominating the bigger but slower Margarito almost from the opening bell. Pacquiao won round after round, opening a cut on Margarito’s cheek, closing his right eye, and turning his face into a bloody mess. The punches came quickly, and they came often. 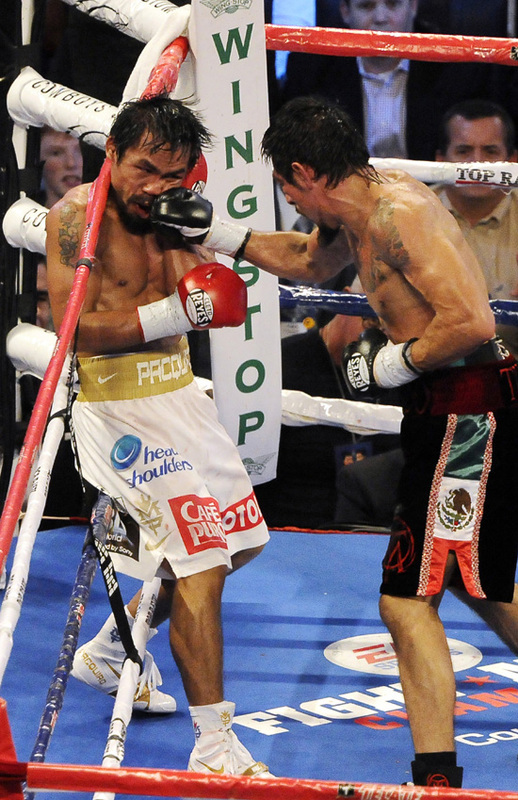 Margarito was plenty game as he tried to stalk Pacquiao around the ring, but every time he got close Pacquiao would land a four- or five-punch combination that snapped his head back and stopped him in his tracks. 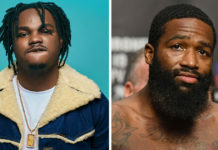 The beating was so thorough that the congressman from the Philippines turned to referee Laurence Cole several times in the 11th round, imploring him to stop the fight. 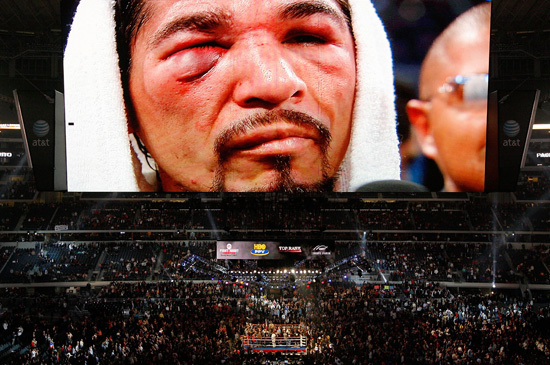 It went on, though, even though Margarito had no chance to win. 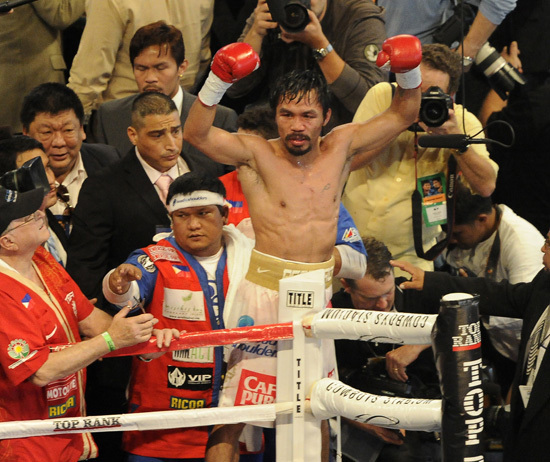 “I can’t believe that I beat someone this big and this strong,” Pacquiao said. “It’s hard. I really do my best to win the fight.” Pacquiao moved up in weight yet again to take on Margarito, a natural welterweight with a reputation for ruggedness in the ring. And rugged he was, though he took a beating all night long at the hands of a faster and seemingly more powerful opponent. “There was no way I was gong to quit. 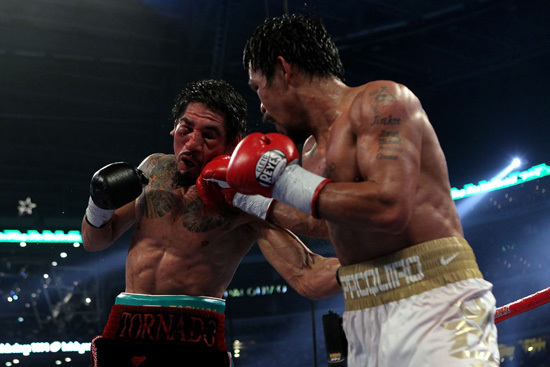 I’m a Mexican, we fight until the end,” Margarito said. 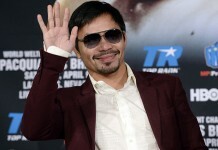 Pacquiao won every round on one scorecard, 120-108, and was ahead 119-109 and 118-110 on the other two. 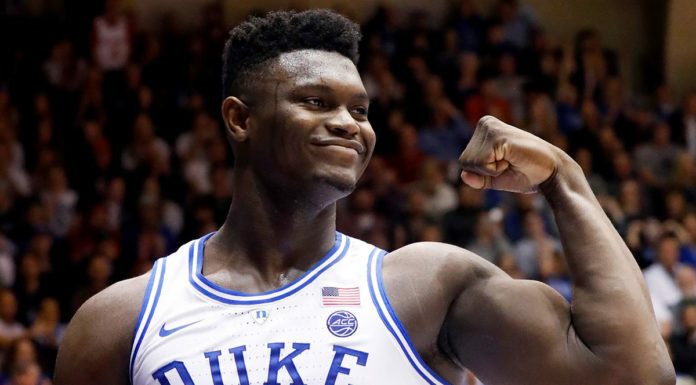 The Associated Press had it a 120-108 shutout. According to reports, Manny Pacquio received $15 million dollars, plus $10 million from Pay-Per-View sales for his fight against Antonio Margarito, equaling $25 million in total earnings!! 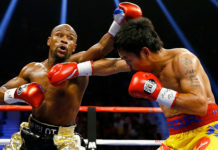 But now everyone wants to know when will Manny Pacquiao and “Pretty Boy” Floyd Mayweather Jr. square off in the ring? 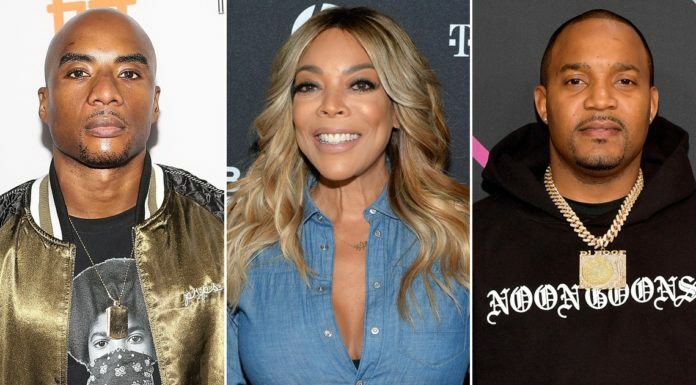 Who do you think would win between the two?